Cal State Los Angeles pitcher David Arredondo (17) delivers the baseball against a SF State batter during the first game of the doubleheader at San Francisco Saturday, March 3, 2012. Arredondo pitched eight innings and gave up four hits and one earned run. The SF State Gators won both games with 2-1 scores. Photo by Godofredo Vasquez. 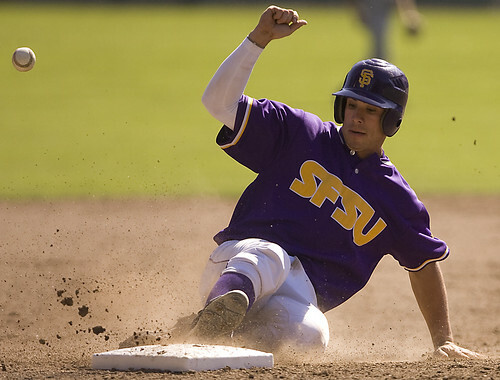 The SF State Gators baseball team managed late comebacks in both game Saturday, beating the Cal State LA Golden Eagles 2-1 in their doubleheader. The key components to the wins was clutch hitting and solid pitching performances. The home Gators improved their season record to 8-7 overall, 7-4 in California Collegiate Athletic Association, after beating the Golden Eagles in the first three games of the series. In the first half of the double header, the Gators were trailing 1-0 heading into the last inning. Cal State LA’s David Arredondo threw eight solid innings, allowing only one run on four hits and striking out eight batters in the process. Unwilling to back down, the Gators had saved their hitting for the ninth. Jacob Valenzuela took over for the Golden Eagles in relief, but could not maintain Arredondo’s success. He give up a leadoff double to Gators third baseman Miguel Flores. Freshman Mark Lindsay moved Flores over to third before catcher Matt Quintero singled to left, tying the game 1-1. 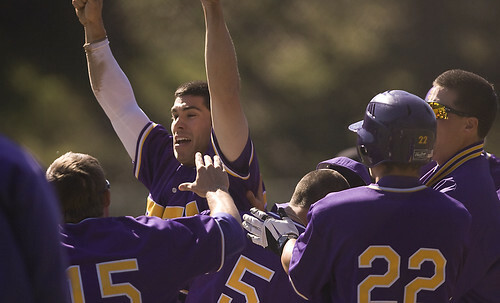 The team continued its late inning success with pinch hitter Sam Wilkins hitting a single to left field, which allowed Quintero to score the game winning run. Pitcher Peter Reyes contributed to the team’s win with three solid innings in relief of starting pitcher Ryan DeJesus, only allowing two hits and earning his third win on the mound. DeJesus helped keep the Gators in the game by throwing six solid innings, allowing six hits with only one run. The team committed three errors in the first game. This was the Gators second straight walk-off win against the Golden Eagles, after they won 8-7 on Friday after Lindsay drove in two runs on his game-winning single. The second half of the doubleheader quickly resembled the first game. 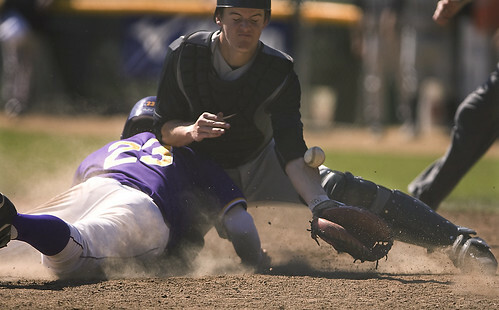 Cal State LA began the scoring in the fourth after second baseman Joe Park grounded out, which plated Cliff Quick on the Golden Eagles’ lone run. Gator starter Matthew Cummins, nephew of the Gators’ manager, continued the team’s dominating pitching, putting up six solid innings and giving up five hits while striking out three Golden Eagles’ batters. Gator offense was delayed once again. The team failed to score until the sixth inning, until their clutch hitting showed up in dramatic fashion for the third straight game. 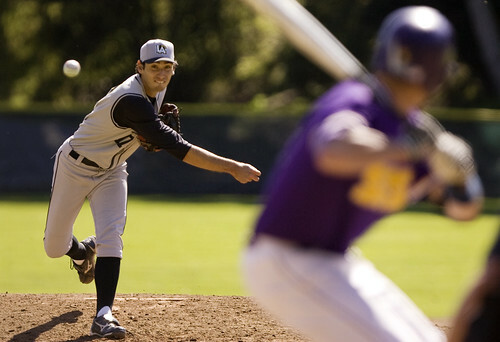 The Golden Eagles’ starting pitcher Gabriel Asakura continued the theme of dominating pitching. He gave up just five hits in six innings, but surrendered two late runs that saddled him with his first loss of the season. Gator outfielder Dustin Wold began the comeback effort by hitting a single to left field, conjuring images of the first game of the doubleheader. First baseman A.J. Pianto got on base next. Flores then stepped up to the plate with two out, singling on a full-count pitch that plated Wold, tying the game at 1-1. The Gators were not done, as Lindsay added a single that ran pinch runner Dante Smith to home plate on the game-winning run. Senior closer Branden Petrangelo worked a perfect seventh frame, picking up his fourth save of the season. The current three-game winning streak has lifted the Gators into third place in the CCAA, passing the rival Golden Eagles in the process. The Gators have a short turnaround, facing the same Golden Eagles squad for the final game of their four-game series, beginning at 11 a.m. Sunday at SF State. 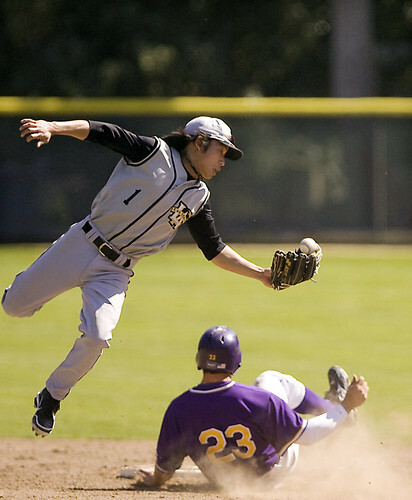 Cal State Los Angeles shortstop Joe Park (1) catches a high throw as SF State's' Matt Quintero (23), right, slides into second base during the first game of a doubleheader at The Swamp, Saturday, March 3, 2012. Photo by Godofredo Vasquez. SF State Gators' Matt Quintero (23) slides to third base as the baseball gets away from the Cal State Los Angeles player covering third during the first game of the doubleheader at San Francisco Saturday, March 3, 2012. After the error Quintero got up and started running to the home plate, scoring the game wining run. Photo by Godofredo Vasquez. SF State's Matt Quintero (23), left, slides safely into home plate for the wining run as Cal State Los Angeles catcher Brian Compton (7) tries to hold on to the ball during the first game of the doubleheader at The Swamp, Saturday, March 3, 2012. Photo by Godofredo Vasquez. SF State Gators' Matt Quintero (23), center, celebrates after scoring the game winning run by sliding home after an error by Cal State Los Angeles during the first game of the doubleheader at San Francisco Saturday, March 3, 2012. Photo by Godofredo Vasquez.